A warming bowl of noodle soup with Sum Yum Kimchi, purple pickled egg and tofu. • Place eggs in saucepan and cover with cold water. • Bring to the boil, reduce heat and let simmer for 6 minutes for a soft-boiled egg and 15 minutes for a hard-boiled egg. • Drain eggs and place to cool in cold water for 5 minutes then peel gently. • Heat frying pan and toast mustard seeds, cardamom, and cloves for a few minutes or until fragrant. • Add 1 ½ cups of hot water, bay leaves, onion, chilli flakes and finely sliced cabbage. • Heat until it just comes to a boil. • Add vinegar, salt, and sugar and mix well. • Turn off the heat and let it rest for 15 minutes. • Place half the cabbage in a 750 ml glass jar, add eggs and cover the remaining cabbage with liquid and place a lid on the jar. • Once it has cooled to room temperature, refrigerate. • Let pickles rest minimum at least 24 hours before eating. • Boil a large pot of water and cook ramen noodles follow directions on the pack. Place cooked ramen in cold water. • Cut tofu into chunks about 1 cm thick and coat tofu with a thin layer of cornstarch in a shallow dish. Remove excess starch. • Set the skillet over medium-high heat and add the oil or ghee. • Fry tofu on each side till golden and crispy. • To prepare the stock, heat sesame oil in saucepan over medium-low heat. Sauté the ginger, onions, and garlic. When they are translucent and fragrant, pour the stock into the saucepan and simmer for about 5 minutes. • Strain the stock using a fine-mesh strainer and remove onion, garlic and ginger and then put it back in the saucepan with the stock on a medium heat add thinly sliced shiitake mushrooms and cook another 5 minutes. • Season soup with a pinch of salt and few tablespoons of soy sauce. • Drain the ramen noodles well, then transfer the noodles to the soup bowls. Add tofu, shiitake mushrooms and kimchi. 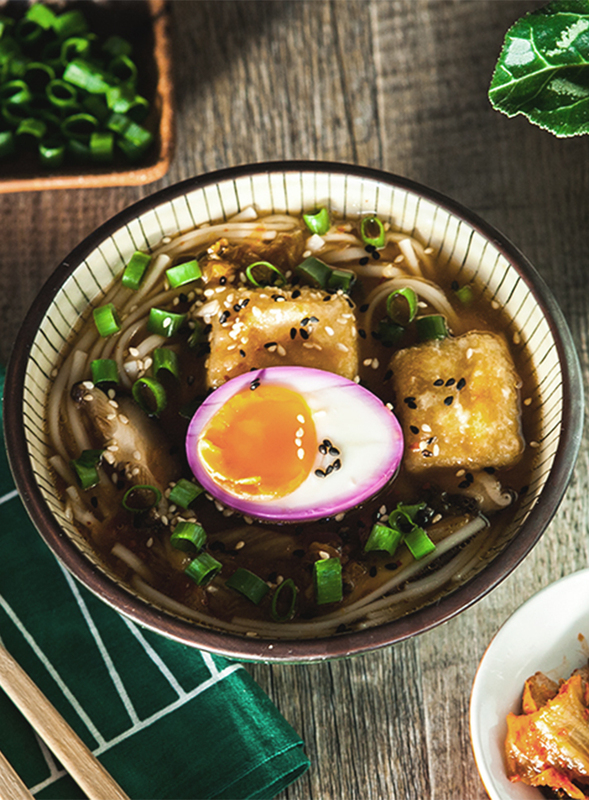 • Pour the hot soup into a bowl, place half a pickled egg on the top, sprinkle with scallion and sesame seeds.